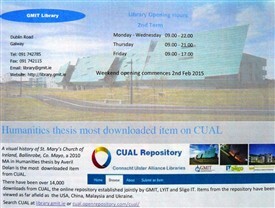 GMIT Library announces that the most downloaded thesis, at over 14,000 downloads, from the CUAL (the Connacht Ulster Alliance Libraries) was A Visual History of St. Mary’s Church of Ireland, Ballinrobe, Co. Mayo; a Humanities Master’s Thesis by Averil [Dolan] Staunton, founder member of the Ballinrobe Archaeological & Historical Society. 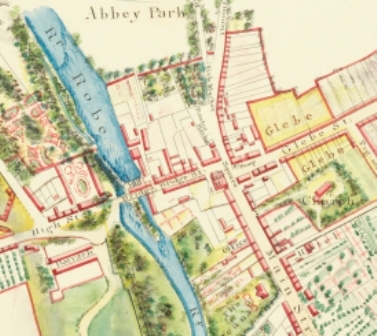 Averil informed us that this thesis was the inspiration for creating the wwwhistoricalballinrobe.com website in order to share the wealth of history and heritage about Ballinrobe, the oldest South Mayo town. 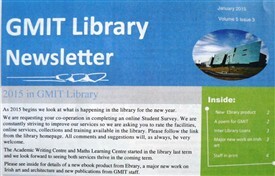 The Connacht-Ulster Alliance (CUA) is a strategic partnership formed by Galway-Mayo Institute of Technology (GMIT), Letterkenny Institute of Technology (LYIT) and Institute of Technology, Sligo (IT Sligo), with the aim of achieving Technological University status. This page was added by John Kelly on 28/02/2015.